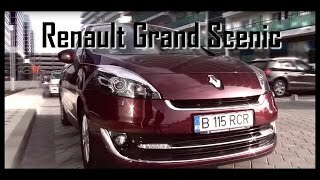 Renault Scenic and Renault Grand Scenic gets revamped for the January 2012. The new models of the compact MPV feature dynamic new lines, performance enhancements along with improved fuel efficiency (4.4L/100km). The two new 'Energy' engines are the main reason behind the improved fuel efficiency and performance. 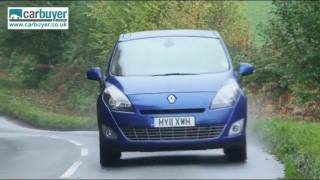 The prices for Renault Scénic Collection 2012 and Renault Grand Scénic Collection 2012 start from €21,350 and €24,850 respectively in France. 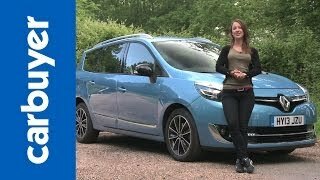 Renault Scénic and Grand Scénic, Europe’s number one compact MPV range, to undergo renewal in January 2012. Dynamic new lines for even more motoring enjoyment, plus enhanced performance and improved fuel efficiency (with CO2 emissions as low as 105g/km) thanks to the introduction of two new ‘Energy’ engines. New technologies for business users and ordinary motorists: Visio System, hill start assist, motorway-mode indicators and Fleet Management System. 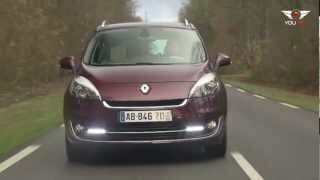 The range features an equipment upgrade, while prices in France start from €21,350 (for Renault Scénic Collection 2012) and €24,850 (Renault Grand Scénic Collection 2012). The success enjoyed by the Bose® Edition limited edition version in 2011 has led to it becoming an equipment level in its own right. Order books in France open on December 1, 2011. 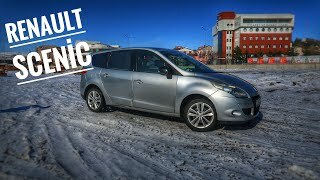 The forceful, fluid, dynamic lines of the Collection 2012 versions of Renault Scénic and Grand Scénic will enable motorists looking for a spacious interior to enjoy attractive, dynamic exterior styling, too. The revised front end is both modern and status enhancing, while Scénic’s new rear lights add a particularly dynamic touch. The upgrade continues with the availability of LED daytime running lights, gloss black features and chrome details (at the front, plus tailgate strip and side moulding insert), plus a new range of wheel trims and aluminium alloy wheels. Grand Scénic’s more horizontal front-end lines and longitudinal roof bars contribute to the model’s even more imposing looks. The range also features two new body colours: Grenat Red and Majorelle Blue. Two new interior trims have been added to the catalogue (a new beige trim for the Expression and Privilège/Initiale equipment levels, plus a new dark charcoal trim for Privilège/Initiale versions), while the upgrade continues with the availability of new fabric upholsteries and a new leather/Alcantara ‘pack’. Meanwhile, following the success enjoyed by the Bose® Edition Scénic and Grand Scénic in 2011, this limited edition version has now become an equipment level in its own right to round off the range with a distinctive, more extensively-equipped high-end version which combines sporty elegance with a unique audio experience. The two new ‘Energy’ powerplants that can be specified for Collection 2012 versions of Renault Scénic and Grand Scénic deliver even greater driving pleasure and frugal fuel efficiency thanks to several innovative technologies derived from Formula 1 (Stop&Start, braking/deceleration energy recovery, etc.). From January 2012, Scénic and Grand Scénic will be the first Renault models to be available with the new Energy dCi 110 diesel engine which combines record low CO2 emissions (105g/km), a 12 percent saving in fuel consumption (down to 4.1 litres/100km) and higher torque (260Nm at 1,750rpm; a gain of 20Nm) compared with the existing 1.5 dCi 110. Also available will be the diesel Energy dCi 130 (114g/km, 4.4 litres/100km, a 20 percent fuel consumption saving over the 1.9 dCi 130 engine it supersedes) which will provide Scénic and Grand Scénic with the class’s best two diesel engines, for enhanced driving pleasure and the market’s lowest fuel consumption. From spring 2012, the Scénic/Grand Scénic line-up will also include the brand new Energy TCe 115 petrol engine which boasts low CO2 emissions (135g/km) and a 20 percent reduction in fuel consumption (a saving of 1.6 litres/100km) compared with the 1.6 16V 110hp. Thanks to these engines, Renault Scénic and Grand Scénic will play an important part in achieving Renault’s target to become Europe’s number one manufacturer with regard to the CO2 emissions of its range, without detracting from performance. Enhanced everyday safety, facilitating life for drivers and maximising occupant wellbeing continue to be priorities for Renault. Scénic and Grand Scénic will be the first Renault models to feature the Visio System which assists the driver’s vigilance and night-time vision thanks to two key functions. a lane departure warning system (a camera detects if the drivers strays out of lane and triggers an audible signal) and an automatic headlight function (the same camera detects the lights of nearby vehicles and/or the presence of street lighting to automatically switch from dipped to main beam, and vice versa). Driving and travelling comfort have been further enhanced by the addition of new features which come as standard equipment. Hill-start assist prevents the vehicle from rolling backwards when pulling away on a slope, while motorway-mode indicators warn other motorists when the driver is about to change lanes by flashing three times following a slight flick of the indicator stalk. The Collection 2012 versions of Scénic and Grand Scénic carry over technologies that have helped forge the model’s success, from the tailor-engineered sound of the Bose® audio system to Carminat TomTom® navigation and associated LIVE services (HD Traffic, etc.). Business users have not been forgotten, either, since Renault has contributed to facilitating the work of long-term lease companies and fleet operators thanks to Fleet Asset Management. This unique, optional service provides business customers with some 30 daily data feeds (distance travelled, fuel consumption, oil level, etc.) to help them optimise fleet and cost management. Scénic and Grand Scénic, are manufactured in Douai, in northern France, where they benefit from the most exacting production standards to guarantee the highest level of quality. Together, Scénic and Grand Scénic top their segment in Europe, with sales in excess of 400,000 units since the launch of the current generation at the end of 2009. Almost 3.9 million units have been sold since the introduction of the original Scénic in 1996. Collection 2012 versions of Scénic and Grand Scénic will initially go on sale across Europe in January 2012. They will then become available in their different markets across the world (notably Turkey, Israel, Morocco, Algeria, Tunisia, South Africa, Russia and China) in the course of 2012.